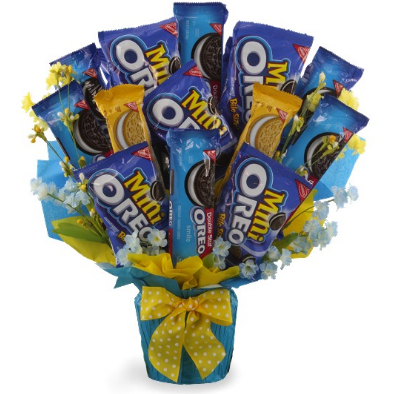 One of the easiest gifts to make for any occasion is a cookie bouquet. They are ideal for the person who seems to have everything or the person you want to make smile by giving an unexpected treat. There are a few steps in completing the bouquet, but once you begin creating, it’s sometimes hard to stop as you begin thinking about holidays, birthdays and other special events that might look better with a bouquet of sweet treats. The first thing that you need to do is decide on the occasion and the shape of the cookies that you want to make. You can get cookie cutters so that you have straight edges and designs that look professional, or you can roll cookie dough and cut the shapes with a knife so that they are a little more personal in appearance. Once the cookies are baked, you should decorate them before letting them cool. Make sure the icing is hard once it sets on the cookie. This will prevent the icing from coming off the cookie once it’s wrapped in plastic. Add small decorations, such as edible glitter and sprinkles, to the cookies for a beautiful touch so that they don’t look plain. When you have all of the cookies made and wrapped, you can begin assembling the bouquet. Find a basket that matches the celebration. A colored basket will also work if you wrap a ribbon around the edges with pictures of the theme for the event. After the basket is decorated, place a piece of foam in the bottom. This will hold the wooden sticks that are placed on the back of each wrapped cookie. Use hot glue to secure a wooden stick onto the back of each treat. These can be purchased at most craft stores. Stagger the cookies so that they aren’t on one level when you look at the bouquet. Add decorations to the basket to match the celebration, such as pumpkins for Halloween or small Santas for Christmas. Make the basket as personal as possible with items that the recipient will enjoy and cookies in the flavors that the person will like. This entry was posted in Business, Gift idea, Occasion and tagged cookie, cookie bouquet, gift idea for any occasions on July 8, 2016 by Yami.